From SFSite.com: Mary Gentle left school at 16 and worked a variety of jobs such as a cinema projectionist, a warehouse clerk at a wholesale booksellers, a cook in an old folk's home, a valuation officer for the Inland Revenue, and a voluntary Meals-on-Wheels driver before finally becoming a self-employed writer in 1979. 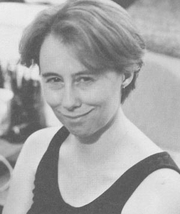 Mary Gentle is currently considered a "single author." If one or more works are by a distinct, homonymous authors, go ahead and split the author. Mary Gentle is composed of 4 names. You can examine and separate out names.